Avec is unique. One of Paul Kahan’s culinary babies, it focuses of the cuisine found on the Mediterranean Rim. The flavors are intense and well focused. Technique is top notch and frankly, some say, you won’t find a better meal ANYWHERE in Chicago for what you will pay at Avec. Not to say that Avec is cheap, it merely brings some of the city’s best talent, best product and best drive to the center stage for the masses. Yes, communal seating is the norm here, but once you’re focused on your company and the incredible food, you won’t even notice the conversation taking place a couple feet from your ear. Everything is meant to be shared. You order and the dishes arrive as they hit the expo line. 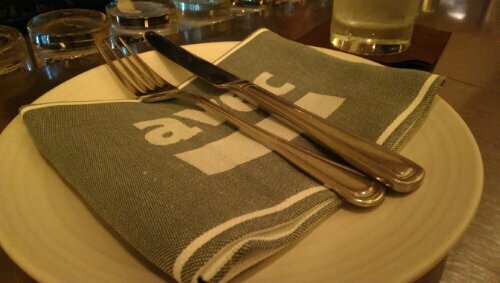 One of their signature items you absolutely must enjoy on your first visit is the Avec Date. 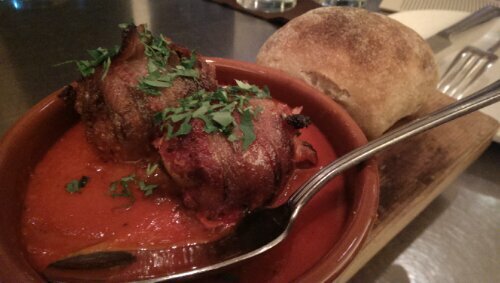 Two plump dates stuffed with house made chorizo and then wrapped in thick cut bacon. They render the fat in the bacon and then place the morsels in a crock. A delicious sweet and spicy red sauce covers the dates as they cook. Warm, sweet, salty and a touch of heat from the sauce. I can see why this dish is seen as one of the best bites in town – period. 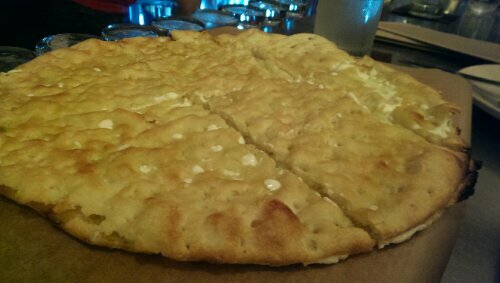 Chef recommended we try their truffle focaccia flat bread. Two paper thin focaccia sheets with a thin layer of cheese in between. Truffle salt and oil is drizzled over the top and you have yourself a simple but extremely delicious and earthy creation. Crispy and so balanced in flavor. Truffle doesn’t overwhelm the senses and the light airy and flaky focaccia is superb. Brandade. Salt cod, dried out and pureed to create a creamy, briney, fishy spread. Unique and an absolute delicacy in some parts, a killer brandade is worth a trip alone to visit that smart chef who chooses to feature it on their menu. 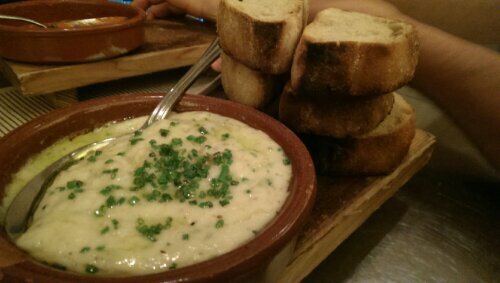 Everyone should try brandade sometime. It is a mild flavor overall and the creaminess makes it approachable to even the more novice palates. Combined with the crunch from a nicely toasted crostini, how could a fish lover not be instantly drawn to this. Slow Roasted Pork Shoulder. If you ever see this on a menu at a quality establishment, I highly suggest you consider the regret you may experience later that evening if you don’t speak those four beautiful aforementioned words to your server. 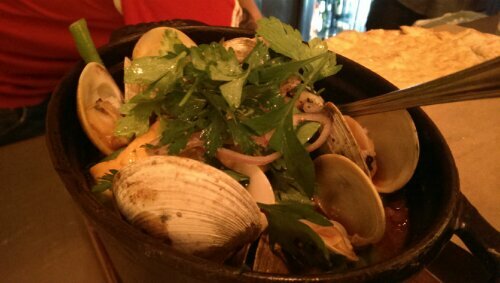 Avec pairs their unbelievably juicy and tender pork with fresh Little Neck Clams, bomba rice, peas and smoked paprika. The combination of flavors is layered and extremely complex. The pork is just fatty enough to bring that richness to the forefront with the spice form the paprika and fresh clams bringing balance to the plate as a whole. 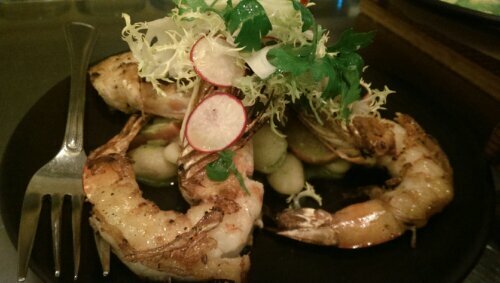 Head-on prawns char-grilled and served over a white bean salad concluded our meal. The shrimp were tender, marinated to produce a profound flavor that mixed well with the char from the grill. Sucking the juice from the head was heavenly. The light frisee salad that topped the prawns was a fresh cleanser for our dessert which, unfortunately, is for another post. ← #144 – Bop n’ Grill. East meets Midwest at its best.